Some 10,000 residents of Aleppo fled their homes over the weekend as Syrian President Bashar Assad’s forces, backed by Russian air support, advanced on the besieged city. Assad’s forces regained control of six rebel-held districts in eastern Aleppo amid heavy fighting over the weekend, forcing huge numbers of civilians to flee, the Syrian Observatory for Human Rights reported. On Nov. 27, the 13th day of the Aleppo operation, government troops took control of the neighborhoods of Jabal Badra, Baadeeen Inzarat, Al-Sakan, al-Shaabi and Ain al-Tall, according to the Observatory. Government forces are now “in control of most of the northern part” of Aleppo, according to the monitoring group. 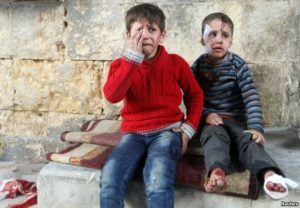 Since Nov. 15, 212 civilians, including 27 children, have been killed in airstrikes on Aleppo, the Observatory said. UN envoy Staffan de Mistura warned last week that time was “running out” for efforts to avoid a humanitarian catastrophe in Aleppo.